Unusual start to this morning with a phone interview with Jeremy from ABC South West Victoria. 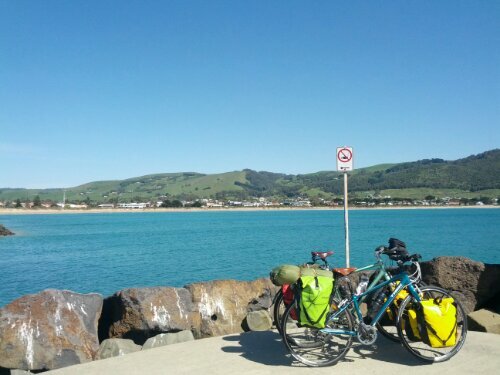 We talked about our Great Ocean Road cycle trip and why we choose it and the stuff we took. 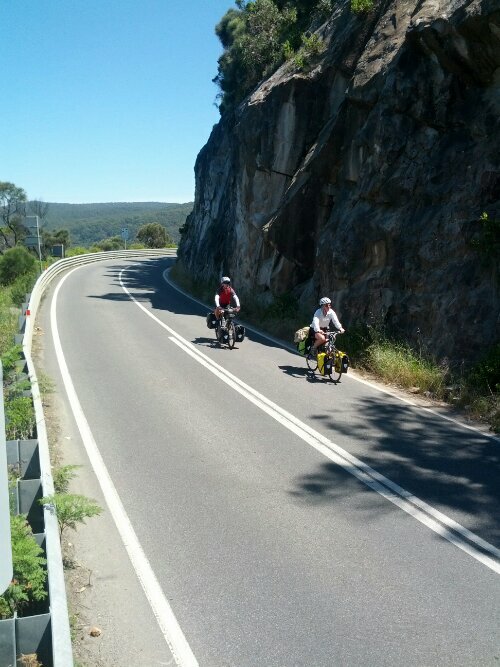 He himself is going to be riding a similar route in a couple of weeks time with Bike Vic. Hello to any new readers from ABC South West Victoria! Certainly a fun and new experience! 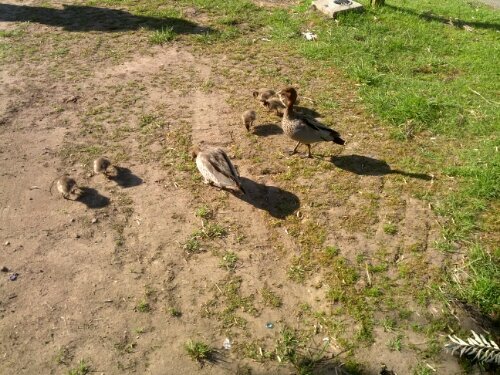 Today, the weather hit hard early with 30 degrees forecasts and heavy Northerly winds. It was hot by 8:30am! 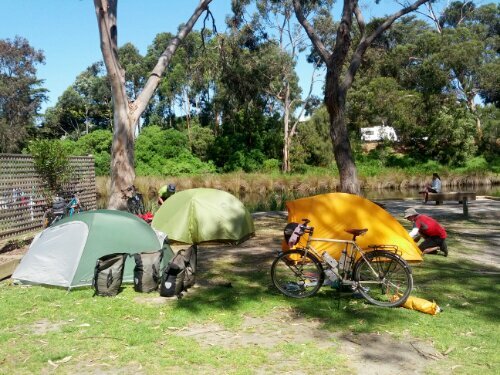 We had breakfast at camp before rolling out for a quick lap of Apollo Bay and stocking up on bakery goods before hitting the road. The riding was fantastic! 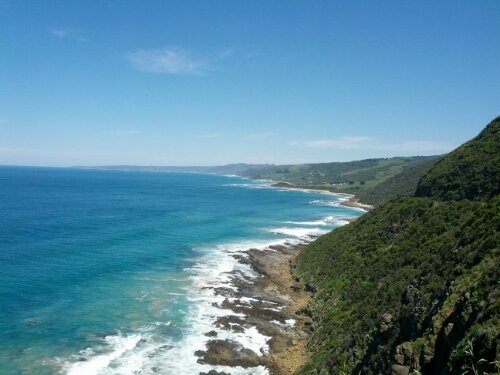 Rolling hills with cliff and bush on one side then the ocean and epic views on the other. We stopped at every pull over location to enjoy. We might have even glimpsed Tasmania. When not rolling hills and sea vistas, the coastline was punctuated with quaint little coastal towns that must be great locations to spend some time. Perhaps next tour! 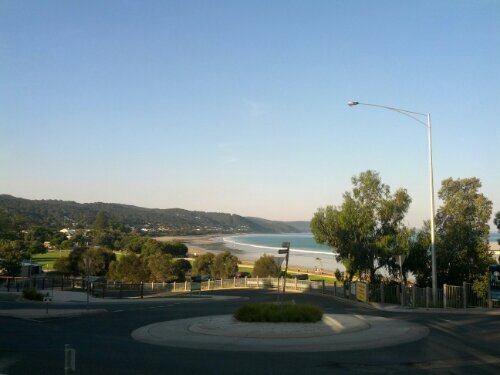 Lunch was at Wye River at a very upmarket Cafe that even had roadie style bike parking. We wanted to use it but didn’t think the Brooks saddles would sustain the weight of the laden bikes. The coastal route seemed to keep the temps down although the bike computers told us it was 34 degrees, it didn’t feel that hot. Because of the winding nature of the road, the windy northerly headwinds only became apparent on short stretches. 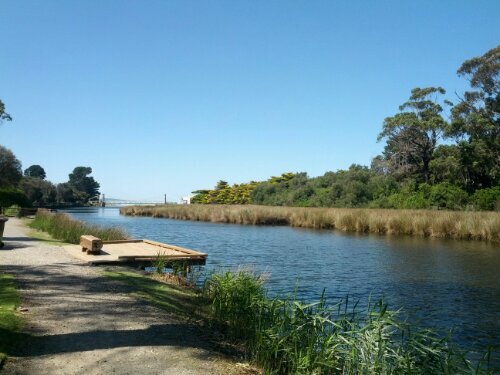 Arrived at Lorne the earliest yet and set up camp on a lovely estuarine creek with heaps of ducks and a nice walking track direct to the beach. Once set up, we went to the beach for a quick swim. Water was 14 degrees and too cold for a long swim for the Queenslander’s. But quite refreshing none the less. Wow the ride is now getting regional publicity. Glad it was the ABC and you didn’t have to face the moral dilemma of being interviewed by a commercial radio station. Camp looks good thanks. Like to see some cooking and eating photos. You are doing your own cooking or is it restaurant dining all the way?